Celebrate your special day with our Meant to Be package at the Monarch Club! Contact Lindsee Jackson for additional information or to set up a tour at lindsee.jackson@trilogyresort.com or 805.343.7505. Book a bridal or baby shower to be held during April or May, 2019 and receive a complimentary welcome glass of bubbles for attendees! For details, contact lindsee.jackson@trilogyresort.com or 805.343.7505. Make every occasion an experience with the Monarch Club as the host of your next party. We offer the ideal setting for any celebration or special occasion, from anniversary parties to birthdays. CALL 805.343.7505 TO LEARN MORE AND BOOK A TOUR. If you're looking to impress your clients, customers or employees, we offer specially designed event packages that include meetings, holiday parties and more. Nestled in Nipomo’s eucalyptus tree forest on California’s Central Coast, the Monarch Club provides a beautiful setting featuring rich architecture and chic design. Views of lush, green rolling hills of the Monarch Dunes Golf Course provide a breathtaking backdrop for any event. As the only all-inclusive resort club on the Central Coast, the Monarch Club is the perfect place to host your wedding, special event, or corporate meeting. Your guests may enjoy amenities such as Adelina’s Bistro, Sandalwood Spa, the Avila Room, the Sculpture Garden, the Art Studio, and executive meeting rooms such as the Wine Library and the Captain’s Room. 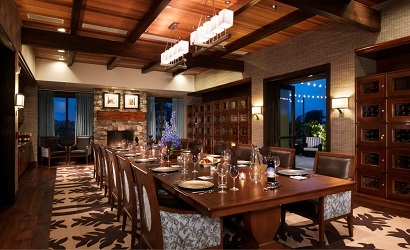 Our professional events team would be excited to speak with you about all the options available at the Monarch Club. To speak with our Catering & Events Manager or to arrange a personal tour of our venue, please contact us at 805.343.7505. Nestled back along the pine trees of the Monarch Club rests our private Tai Chi Garden, a beautiful setting for a serene ceremony. An exciting gathering place for events and receptions. Tastefully lit sculptures emerge from the plaza creating a majestic ambiance. Includes an outdoor fireplace and white twinkle lit lemon trees which create a dramatic setting for dinners and receptions. With breathtaking vistas of the Monarch Dunes Golf Course, the event lawn overlooks the first tee to create the perfect backdrop for your ceremony. Boasts views of lush rolling hills surrounded by Nipomo's beautiful native Eucalyptus trees. The Wine Library will make your guests feel as though they have stepped into a winery's private vintage reserve room. Offers a variety of menu options to suit any palate. The grandeur setting of the Captain's Room will make any occasion classy and sophisticated. Chef Charles Weber emphasizes cooking with the seasons and introducing seasonal products into a constantly evolving, diverse menu. His cooking background is strongly rooted in French classic technique, but his cooking mentality is cutting edge. He brings over 30 years of meticulously crafted upscale American cuisine, combined with his original, innovative style of emphasizing regional culinary practices. Chef Charles has appeared on Food Network Latin America, WBBM – CBS Chicago, a “California Cooking” TV segment, and has consulted for Sunbeam Grills, Cuisinart, Presto Pressure Cookers, Saveur Copper Cookware and Cutlery, has contributed to cookbooks and food magazines, and even prepared the 90th birthday dinner for winemaker Robert Mondavi. His accolades include culinary ambassador of the United States for the 1993 Bocuse d’Or competition; representative for Blackhawk Lodge Restaurant for the James Beard House in New York City, and Chef of the Year award by the National Executive Chefs Association, for his culinary contribution to the city of Chicago. What is the schedule of payments? Remaining balance is due 7 days prior to the event date with final floor plan and guest count guarantee. Any “day of” charges are due at the conclusion of the event. The final balance, finalization of details consultation, Banquet Event Order and floor plan are due 7 days prior to your event. A guest guarantee is required 7 days prior to your event. The guaranteed number is not subject to reduction. All catering is provided by the Monarch Club’s Culinary Team. Due to health department regulations, no food of any kind, except specialty desserts or wedding cake, may be brought on or leave the facility or taken at the conclusion of the event. No outside food items will be prepared, served or stored in or on premise refrigeration. Due to our San Luis Obispo County Liquor License, the Monarch Club cannot allow you to provide your own alcohol. However, we do offer beer, wine and liquor packages, with a full variety of options. Yes, absolutely! If you need help choosing, we have a preferred list of recommended professionals that are familiar with the property.